With its 5-phase filter technology, the GROHE Blue filter purifies your tap water, giving it a fresh refined taste. As water passes through the filter, undesirable substances such as chlorine that could cause odor or affect its taste are removed. The fine particulate filter retains even the tiniest particles, leaving nothing but pure water with a great fresh taste. The filter also extracts heavy metals and reduces the lime content of the water significantly. Changing the water filter is quick and hassle-free, ensuring a reliable supply of fresh, lime-free water straight from your faucet. 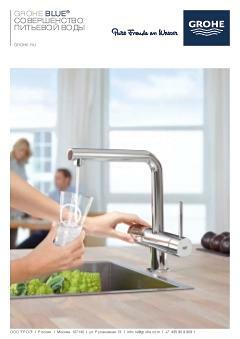 The GROHE Blue Duo faucet delivers both ordinary tap water and pure filtered water with a great fresh taste. Replacing your regular faucet with this innovative and efficient model will be super easy and hassle-free. Its high spout is perfect for filling tall carafes. Безупречная функциональность в повседневной эксплуатации: данный излив плавно поворачивается в пределах угла в 140°, что обеспечивает Вам полный контроль над направлением потока воды и исключает задевание окружающих шкафов и стен.